Instant Gallery Maker makes it easy to create professional-looking online photo album with a few mouse clicks! Just add your images to the list, click a few buttons and watch your new web gallery come alive! All the galleries created with Instant Gallery Maker are ready to be published on the web, so you can immediately upload them to your website. Share your family, vacation, personal and other photo albums with your friends! Create professional-looking online photo album with a few mouse clicks! ...... example galleries above). Or you can spend some time to customize look and feel of your gallery. You have total control over every tiny detail of your web gallery! 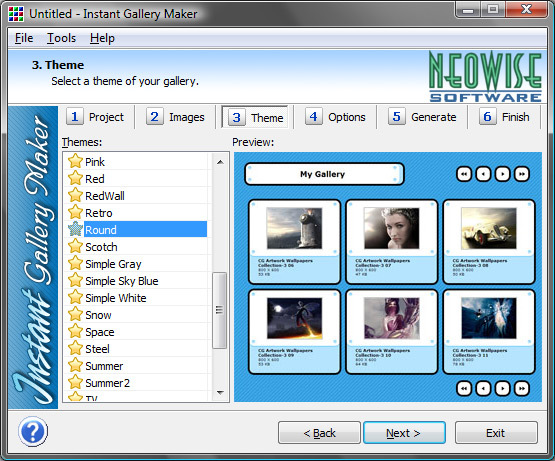 Instant Gallery Maker recognizes all popular image formats (jpg, gif, tiff, bmp, png, etc.). You can also save the templates you created and reuse them later. Very easy to use - creating a web image gallery has never been easier! Just click a few buttons and watch your gallery come alive. User friendly - wizard-style interface makes Instant Gallery Maker manageable even for those who don't understand HTML and CSS. Flexible - you have total control over every tiny detail of your web gallery. Powerful - recognizes all popular image formats, resizes pictures using smart algorithms earlier available only in full-fledged image editors. Qweas is providing links to Instant Gallery Maker 2.1 as a courtesy, and makes no representations regarding Instant Gallery Maker or any other applications or any information related thereto. Any questions, complaints or claims regarding this application Instant Gallery Maker 2.1 must be directed to the appropriate software vendor. You may click the publisher link of Instant Gallery Maker on the top of this page to get more details about the vendor.